“El Rancho Grande,” more completely “Alla en el Rancho Grande,” is a traditional Mexican ballad in the style known as Musica Ranchera or “ranch music.” Ranchera is a type of song featuring themes of love, patriotism and nature typically sung on Mexican ranches dating back to the time of the Mexican Revolution in 1800. “Alla en el Rancho Grande,” a Spanishlanguage song, has become one of the best-known cowboy songs in the Southwestern United States largely popularized by the 1936 Mexican film by the same name. It has been sung by well-known recording artists from Bing Crosby to Elvis Presley. People living in the area of today’s Mexico have a rich tradition of musical culture. During the Mayan civilization, ocarinas (flutes) and percussion instruments similar to maracas were used. The Aztec civilizations sang various kinds of hymns. 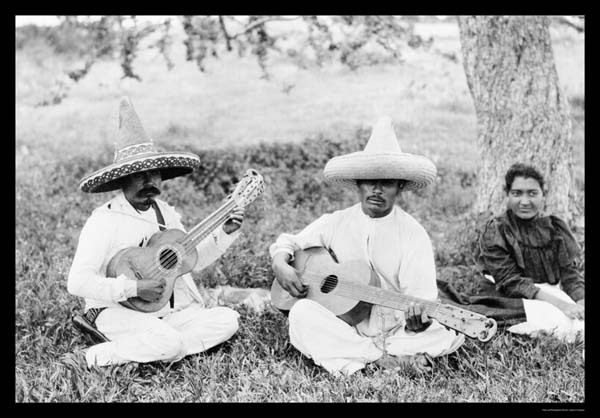 When the Spanish defeated the Aztecs to conquer Mesoamerica (central region of Mexico), they imported a mix of Spanish violin and guitar music and the music of African slaves that traveled with them to Mexico. When Mexico became independent from Spain at the turn of the 19th Century, Bohemian immigrants from Central Europe began to settle Northern Mexico (today’s Texas) bringing the waltz and polka dances to that area. In the 1830s, German immigrants established the first settlements from the Texas coastal plains into the hill country. This area became known as the German Belt. Bringing with it the accordion along with its waltzes and polkas, this culture mixed with the indigenous, Spanish, African and Cuban musical cultures already there to form the Ranchera style and the Nortenos music (a similar style found in the Northern Mexico). 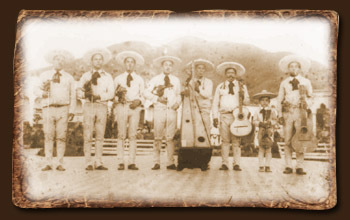 Before the Mexican revolution, the musical regions of Mexico could be differentiated by what was termed “the nine sons.” Ranchera is an outgrowth of “son jalescenses.” “Son Mariachi” - (dancers on a wooden platform), is the most familiar son in the past. Today, Mariachi is closely tied to the style of Ranchera and has become the best known music of Mexico. Although smaller groups are common, Mariachi music is most authentically played by a band of eight performers consisting of three guitarists (Spanish guitar, vilhuela and guitarron), three violinists and two trumpets. From Book II of the O'Connor Method. Thanks for writing this blog. As an almost-lifelong Californian and now violin student, this music has always intrigued me and I'm glad to read about its history.